I don’t care if you smoked last week.What I care about is honesty. If you lie, you withhold facts to get ahead, I’ll cut off your balls and bury you. If you’re going to ask me what “Marauders” was about, I’ll owe you the answer. Because to be honest, this was such a complicated story that I couldn’t understand what was happening while watching. Let alone that I could still retell it now. The big jumble of storylines is just as inextricable as a fisherman whose fishing line has become entangled in a bush behind him. However, the beginning was promising. An action-packed and brilliantly filmed bank robbery with the masked robbers working in a consequent way using high-tech gadgets. But unfortunately, this is the only thing that causes excitement. The rest is simply too boring and an incomprehensible mess. Yes, it’s a movie made for Bruce Willis. And who to expect in a mediocre crime/action film? Yep, Bruce Willis is back. This time it’s not his lamentable acting that makes him look bad, because he doesn’t even get a chance to fail in that. His part is extremely limited, so we only get to see him a few times. And the boredom is easy to read from his facial expression. Although he’s the central figure, the only thing he can produce is some doubtfully frowning. That’s in line with previous roles he played. The only constant in his career at this moment. His picture on the film poster is bigger than his character in the film. The person who could keep up. Call me! The only character I enjoyed was Christopher Meloni as FBI agent Montgomery. An impressive guy who tries to find out why banks of Hubert International (Bruce Willis is president of) are being robbed. But as I said before, this leads to a fairly complicated tangle of plots and subplots. Before you know it, it’s about a failed military operation in Afghanistan where a soldier was killed (or not? ), a group of corrupt agents, corruption at a political level and the wife of a policeman who has cancer. Enough to fill a whole season of a new police serial. 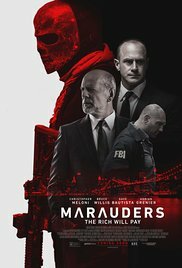 “Marauders” is again such a film you better forget about quickly. The only thing that kind of stayed with me is the fact it rained continuously the entire film.